The shift to ‘non-traditional’ marketing and its numerous touchpoints has triggered unprecedented increases in the volume of data generated. Not only is the volume of data growing exponentially, it’s coming in thick and fast from myriad places and in multiple formats. It’s ‘Big Data’. Big data isn’t a typical IT problem; it can’t be dealt with by traditional number crunchers. Today’s CMO’s must work alongside business leaders to make sure all that valuable data doesn’t go to waste. Businesses need to act fast by turning big data into ‘actionable data’ and acting on it in real time to mirror changing customer needs and preferences. 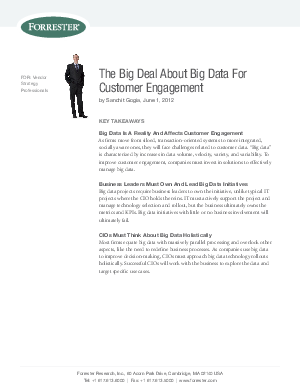 Start capitalising on the big data opportunity.